Home / Retirement / 401k & Investing Tips / 5 Top Stock Trades for Wednesday — Buy Alphabet’s Earnings Beat? We got a decent rally out of U.S. equities on Tuesday, but something about the move didn’t feel right. We’ll have to see how that pans out over the next few sessions. While the S&P 500 was up on the day, we’ll first look at the much different story we saw in small caps on our list of top stock trades. If you remember the initial breakout over $160 back in May, that got us pretty excited with the iShares Russell 2000 ETF (NYSEARCA:IWM). 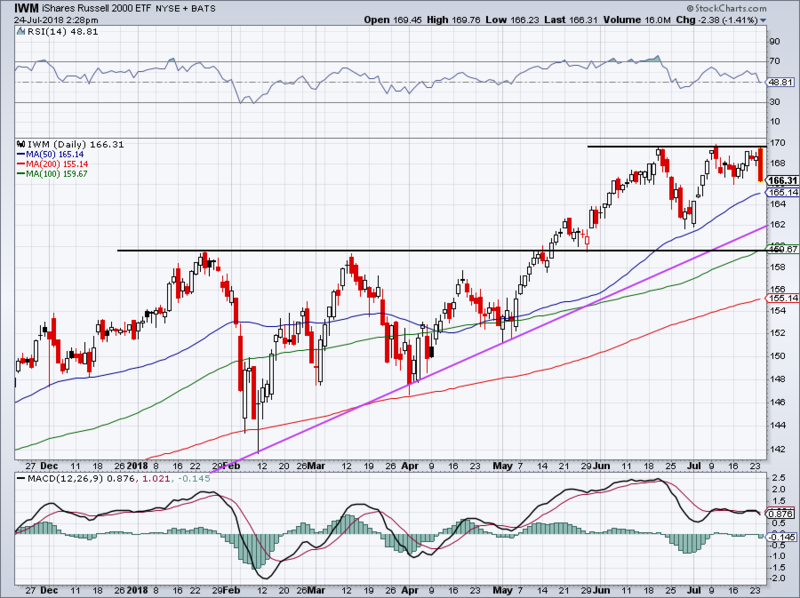 However, $170 has been a different story, a mark that has kept a lid on IWM since June. Even though major indices closed higher on Tuesday, the IWM was hammered, falling more than 1%. This is a divergence that not many people are talking about. If we were looking at this a few days ago, I would say investors could buy a close over the $170 mark. But hindsight is 20/20 and now that IWM is dropping, what should we do? The first step would be to see how it handles the 50-day. If the 50-day holds, a retest of the $170 mark is back on the table. However, if this level fails, then $160 to $162 is back on the table and we’ll have to be more defensive if that’s the case. Baby steps, though. First let’s see how it handles the 50-day. Alphabet (NASDAQ:GOOGL, NASDAQ:GOOG) reported blowout results and crushed its earnings expectations. However, because the stock has been doing so well lately, it could only muster up a ~4% rally on the day. Not unlike Microsoft (NASDAQ:MSFT) when it reported earnings last week. Shares are now entering an overbought area and short-term investors will have to proceed with some caution. Consolidating up near current levels would be the most bullish development, in my view. It can work off some excess before justifying a more controlled move higher. GOOGL now has a strong earnings report in its back pocket and that should give buyers some confidence in the weeks and months ahead to buy-the-dip. I would love a pullback to $1,200, the prior breakout level. A drop down to the bottom of its recent channel near $1,150 and its 50-day moving average would also be an attractive spot to buy. Finally, and perhaps we’re getting a bit over our skis here, but a pullback to the 100-day and the backside of prior downtrend resistance near $1,100 would be a pounding-the-table buy. 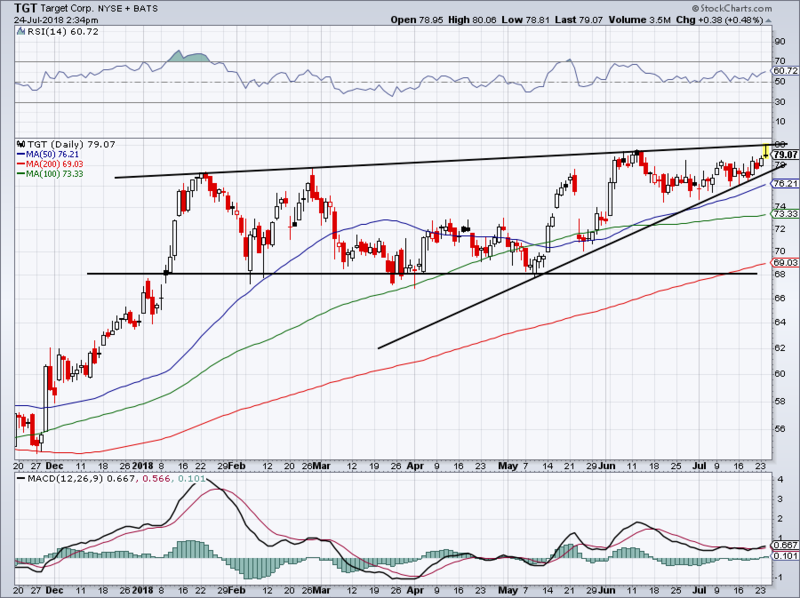 JetBlue Airways (NASDAQ:JBLU) tanked hard after reporting earnings on Tuesday morning. The chart is pretty simple, something we covet in the stocks we’re searching. There’s strong, multi-year support between $18 and $18.50. Below that and JBLU is a no-touch for me. For aggressive bulls who just can’t help themselves, there is a downward-sloping trend-line that JBLU is clinging to at the moment (blue line). Below this mark and I definitely would not take a long trade in JBLU. If it can get back above $18.50, then ~$22 is in the cards. 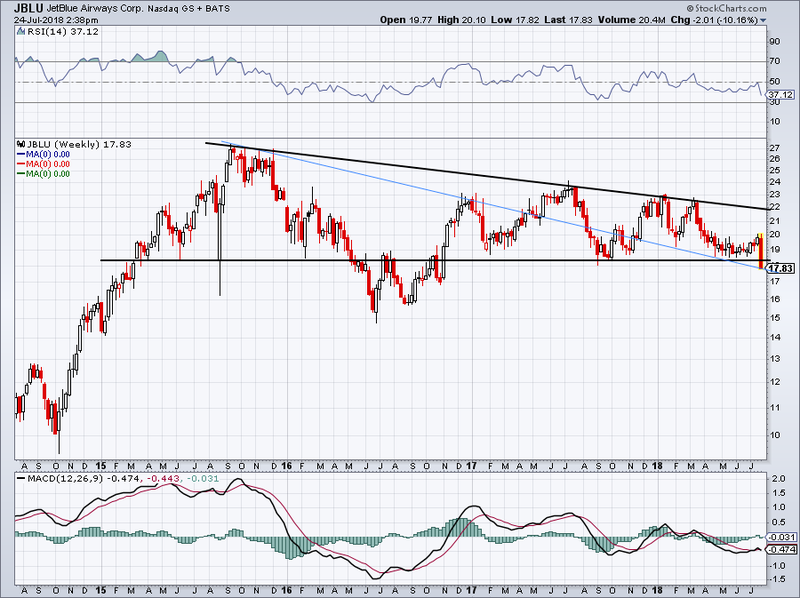 Despite a perfect rejection of trend-line resistance, Target (NYSE:TGT) is still moving in the right direction. 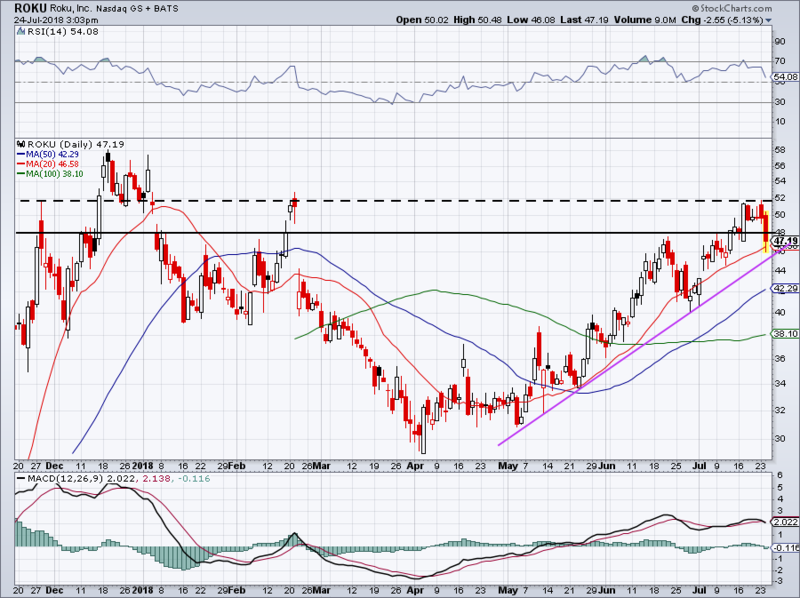 Support is squeezing shares higher and as long as it stays in place, a breakout seems evident. The play? Conservative bulls can wait for a close over resistance. More aggressive bulls can stay long TGT so long as support holds up. Despite getting a $60 price target and holding up well in early trading, Roku (NASDAQ:ROKU) shares were hammered on Tuesday. At one point, they were down more than 7%, which is surprising given how well the stock has been trading. Over $48 was the first sign of optimism, but Roku couldn’t crack $52, a level we pointed out last week. However, new buyers should relish the decline. 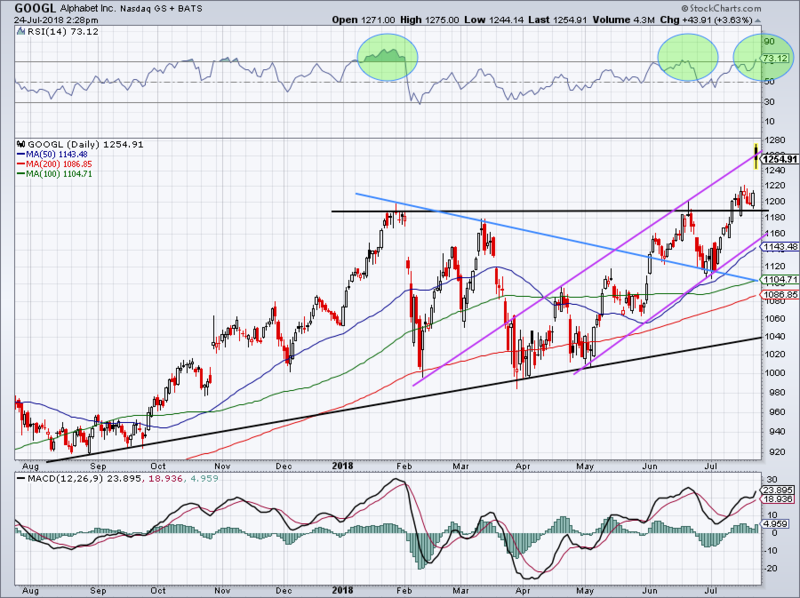 Below $48 is admittedly less positive, but trend-line support (purple line) is now just below current levels while a test of the 20-day moving average held as support. A close below ~$46 and the trend is technically negated. For traders, that means they can risk about $1 in downside and look for about $5 in upside back to $52. Bret Kenwell is the manager and author of Future Blue Chips and is on Twitter @BretKenwell. As of this writing, Bret Kenwell was long ROKU. 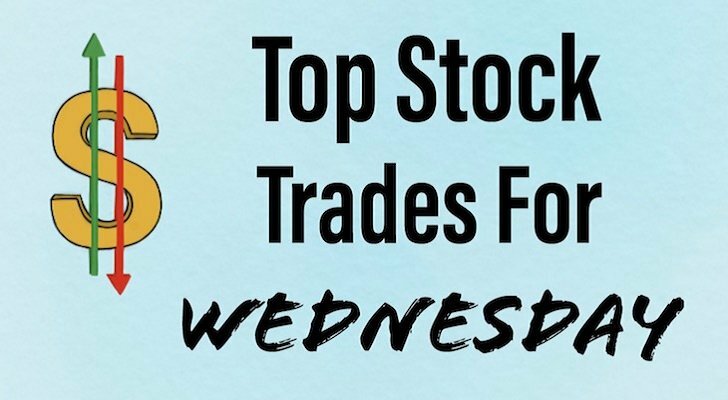 Article printed from InvestorPlace Media, https://investorplace.com/2018/07/5-top-stock-trades-for-wednesday-roku-iwm-googl-goog-tgt-jblu/.